THREE more days! THREE more days! THREE more days! That's right... on Friday, to coincide with the release of the movie, Roaring Forties Press is publishing Rome's Angels & Demons: an Insider's Guide -- a free ebook with inside information about the art and places in Dan Brown's book. And you will be able to get your FREE copy right here! When Langdon and Vittoria first encounter Olivetti and the Swiss Guard, they are frustrated and angry. Olivetti, a man who takes his job seriously, is rather inflexible. “Through the glass, Langdon could see Olivetti say something to the guard. The sentinel nodded. As Olivetti strode out of the room, the guard spun and faced them on the other side of the glass, arms crossed, a large sidearm visible on his hip” (Chapter 36). Olivetti comes from a tradition of protective service that makes many international leaders envious. The men taking part in this sacred ritual join the thousands who have served the pontiff as his army and protectors since 1506. Members of the guard are both ceremonial servants and a well-trained security force, and Langdon is correct to admire and fear them. 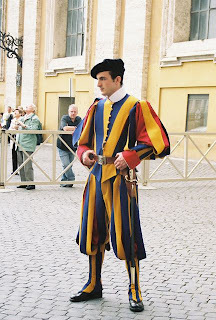 But the question is: why do the Swiss Guard make this solemn oath on that particular day? Find out on Friday! Rome's Angels & Demons: an Insider's Guide is filled with just that kind of information about the historical figures, churches, artwork, and locations that figure prominently in Angels & Demons. With maps, visitor information, photographs, and in-depth insights, it is a great guide to the city of Rome and the fascinating world Dan Brown has created. Check back here tomorrow for another glimpse into Rome's Angels & Demons! Ciao! All the pomp and circumstance around the vatican is so fascinating--I kind of want to watch the documentary on it now.